You have probably seen the mini trampolines that are available for fitness purposes. Unlike large trampolines that are often used for leisure, mini trampolines are used for fitness purposes. They provide a good cardiovascular workout for anyone who is healthy enough to use them. If you are looking for an inexpensive piece of fitness equipment to aid in your daily workout routine, you should consider a mini trampoline. Naturally, the way to use a mini trampoline is to jump on it. Jumping is a form of cardiovascular exercise that can help in physical fitness. Do you remember doing jumping jacks in gym class? This is the same thing only the mini-trampoline makes it easier and takes some of the pressure off of your knees. A mini-trampoline will not afford you the opportunity to do tricks on the fitness equipment. If you want to be able to do flips and other maneuvers, you should invest in a large trampoline. A mini trampoline is something that you can use in your home. A large trampoline must be placed outdoors. If you are trying to lose weight, you should incorporate a good cardiovascular exercise into your home fitness routine. Even if you are trying to maintain your weight, you should practice this type of exercise. Cardiovascular exercise is not only a good way to maintain your weight, but also is very good for your heart. In addition to helping you maintain a healthy heart, cardiovascular exercise can maintain the cardiovascular system, the lymphatic system and even strengthen bones. Cardiovascular fitness is anything that makes your pulse race. Using a mini trampoline in cardiovascular exercise will allow you to jump without greatly impacting your knees. While a mini trampoline cannot be considered a low impact fitness equipment, it is lower impact on your knees than trying to jump on a hard floor. If you decide to purchase a large trampoline for the outside, make sure that you get a protective netting around the trampoline, especially if you have kids. If you do have kids who decide to use the trampoline, you should make sure that no more than one person is on the trampoline at a time to avoid accidents and injuries. Most children end up getting bounced off a trampoline when they are bouncing on it with their friends, resulting in injuries. 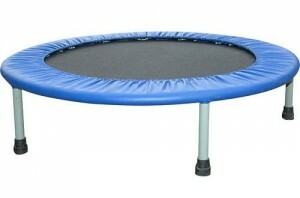 A mini trampoline can be a great piece of cardiovascular fitness equipment if it is used correctly. A large trampoline can also be a way to maintain fitness as long as you make sure it is used in a safe manner. By getting a net around the fitness equipment and making sure that children as well as adults use it properly, you can use trampolines as a form of entertainment as well as an excellent form of cardiovascular fitness equipment. About Author: Dr. Dustin Young is Chiropractor who has an office in Seabrook Texas. His sports medicine practice is based of rehabilitation and chiropractic manipulations. A Chiropractor Seabrook Texas is here for the community.